There is nothing quite like the Melbourne Food and Wine Festival anywhere else on the planet! It spills throughout the city - with huge tables filling laneways and parks. 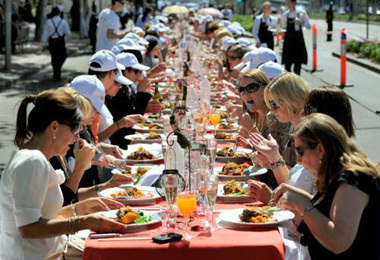 There are over 20 'World's longest lunches', with tables spanning streets, lanes gardens, and even a trestle bridge! It is a must for local and international foodies and connoisseurs, and is an annual celebration of Melbournes infamous love of food and wine. It happens on the streets, in the most lavish and intimate Melbourne spots - down narrow laneways, out into bustling precincts and deep into picturesque wine and river country. The festival attracts the worlds biggest culinary and wine personalities as well as Melbournes own celebrated chefs, restaurateurs, winemakers, sommeliers, producers and artisans. Tours & Crawls, including tours, tasting of various cultures, and subcultures of Melbourne and Victoria. Wine Events, tastes and toasts - together with great tapas and food. Family Friendlyevents, outdoor festival, kids cooking, lunches & dinners. music, food art, galleries and studios. Dinner events, the most exquisite menus, dinners with chefs  the best in town. After Work, feasts, cooking, chocolate, drinks, dinner & wine. Budding master chefs have the opportunity to meet famous Chefs and wine experts from Australia and around the world, sharing their stories, secrets - and taste their creations  in one of the numerous Master Classes. "Id rather eat in Melbourne than Paris." US chef, author and television personality Anthony Bourdain. "Melbourne is the foodiest city in Australia. We are all food-mad, we have the best produce, the best coffee, the best cocktails, the best ethnic eating, and the best home cooks... Every great country has one city that is its foodie heart, its stomach. In France, it is Lyons, home to the bouchons, women-led bistros. In Italy, it is Bologna, home to pasta, prosciutto, parmigiano. In Australia, it is Melbourne." Jill Dupleix, Melbourne Food and Wine Festival Creative Director  Global. "The Chicago Tribune named this particular festival as one of the five things you should do before you die." Chef Damien Pignolet, Bistro Moncur (Sydney, Australia). "For a piece de resistance in a city obsessed with food, little beats the Melbourne Food and Wine Festival." Global travel guide, Frommers (who in 2009 published the festival among its 300 Unmissable Events & Festivals Around The World). "The Festival is what the Victorian public is all about, food, family fun. Its my favourite time of year." Chef Shane Delia, Maha Bar & Grill (Melbourne, Australia) and business partner to George Calombaris. "Melbourne Food and Wine Festival is a real part of the Victorian community because... its inclusive and broad based, offers diversity." Chef Christine Mansfield, Universal (Sydney, Australia). *source Wikipedia, Melbourne Food and Wine Festival. Melbourne Food & Wine Festival.